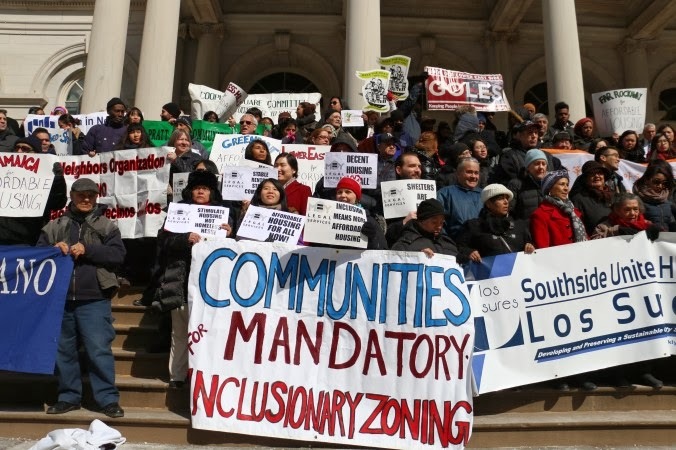 NEW YORK—Residents and community groups converged on the steps on City Hall March 5 to call for mandatory inclusionary zoning (MIZ) laws that would require new medium-to large-sized residential developments to include affordable housing units. “This is a wide array of communities from across the city all calling for a guarantee of affordable housing in future residential developments,” said Barika Williams, policy director for the Association for Neighborhood and Housing Development, Inc. (ANHD). ANHD wants non-expiration affordable housing, so that property owners cannot take affordable housing and turn it into market rate housing later. They ask that if there is any change to affordable housing units because of land use actions, that the units be replaced, and that rent regulated units also be exchanged 1-for-1 in new residences. Click here for the full article.